Torcs were worn around the neck, the upper arm or the wrist during Roman times. This torc is the equivalent of our modern bangle. The image on the front of this card is of Ceres (Summer), part of thr Four Seasons mosaic from the 1st century pavement found in the remains of a Roman town house in Dyer Street, Cirencester in 1849. Ceres is wreathed with corn and flowers and equipped with a sickle and a bunch of corn-ears. 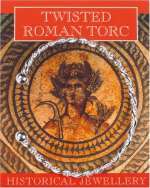 This Twisted Roman Torc is silver plated. The information card is full colour on the front and has historical information on the reverse. A sheet of magnetic words with a Roman theme presented on an information card, which explains what the Roman words mean. A Stags head in pewter supplied on a pin with clasp. The information card gives details about the countryside. Gold plated torc supplied with an information card that describes how torcs were worn during Roman times and also about the mosaic on the front of the card. Pewter Saturn supplied on a quality key chain.